Javier E. Arenas (born October 28, 1987) is a former American football cornerback. 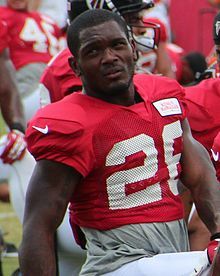 Arenas played college football for the University of Alabama, earned consensus All-American honors, and was a member of a BCS National Championship team. He was drafted by the Kansas City Chiefs in the second round of the 2010 NFL Draft. He has also played for the Arizona Cardinals, New York Jets, Atlanta Falcons, and Buffalo Bills of the NFL. Arenas also had a brief stint with the Ottawa Redblacks of the Canadian Football League. Arenas was born in Tampa, Florida. He attended Robinson High School in Tampa, where he was a first-team All-Suncoast selection in football and a track star. In high school football, he was a highly regarded punt returner and defensive back. He was named USA Navy Player of the Week and Bright House Player of the Week in 2005. He set the record for most punt and kick returns for touchdowns at Robinson as a senior, with four punt-return touchdowns and three kickoff returns for scores, scoring 16 touchdowns overall. In track & field, Arenas was an standout sprinter, competing in the 200-meter dash, with a personal-best time of 22.9 seconds, and in the 400-meter dash, with a personal-best time of 51.48 seconds. He was also a member of the Knights relay teams, running PR of 42.9 seconds in the 4 × 100m, 1:32.31 minutes in the 4 × 200m and 3:30.08 minutes in the 4 × 400m. Regarded as a three-star recruit by Rivals, Arenas chose Alabama over Florida Atlantic. Arenas attended the University of Alabama, where he played for coaches Mike Shula, Joe Kines, and Nick Saban from 2006 to 2009. In the 2006 season, he managed two punt return touchdowns, one against Florida International and one against Oklahoma State in the Independence Bowl. In the 2007 season, he added a 61-yard punt return touchdown against LSU. In the 2008 season, he recorded one pick-six, which came against Arkansas, and three punt return touchdowns, which came against Tulane, Mississippi State, and Utah in the Sugar Bowl. On November 21, 2009, Arenas broke Derek Abney's Southeastern Conference (SEC) record for career punt return touchdowns by returning his seventh punt return for a touchdown against the Chattanooga Mocs in Bryant–Denny Stadium. Following his senior season, he was a first-team All-SEC selection and was recognized as a consensus first-team All-American. The 2009 Crimson Tide completed an undefeated 14–0 season, beat the Florida Gators 32–13 to win the 2009 SEC Championship Game, and then defeated the Texas Longhorns 37–21 to win the 2010 BCS National Championship. Arenas left Alabama with 1,752 punt return yards and 2,166 kickoff return yards, both school records, along with his career average of 14 yards per punt return. Arenas was selected by the Kansas City Chiefs in the second round, 50th overall of the 2010 NFL Draft. The Chiefs previously traded tight end Tony Gonzalez to the Atlanta Falcons to acquire the pick used to select Arenas. On July 28, 2010, Arenas signed a 4-year, $3.798 million contract with the Chiefs. In the 2010 season, he had 39 punt returns for 322 net yards and 24 kick returns for 509 net yards. Arenas scored his first career touchdown on October 23, 2011, against the Oakland Raiders. Arenas finished the 2011 season with 2 interceptions, 33 tackles, and 1 sack. He also recovered a fumble in the game against the Pittsburgh Steelers. For the 2012 season, Arenas tallied 53 solo tackles and 1 forced fumble in 16 games played. He also logged 204 yards in kickoff returns and 297 yards in punt returns on special teams. On May 1, 2013, Arenas was traded to the Arizona Cardinals in exchange for Anthony Sherman. On March 18, 2014, Arenas signed a one-year contract with the Atlanta Falcons. Arenas was signed by the New York Jets on August 11, 2015. He was waived on August 30. On February 3, 2016, Arenas signed a futures contract with the Buffalo Bills. On August 7, 2016, Arenas was released by the Bills. On March 2, 2017, Arenas signed with the Ottawa Redblacks of the Canadian Football League (CFL). He was released by the Redblacks on June 18, 2017. Javier grew up on the east side of Tampa, in the College Hill area, the same place MLB standout Dwight Gooden grew up. At the age of 13, he was diagnosed with having a double aorta arch which required doctors to go in and remove. His father is of Colombian descent and was deported for drug trafficking in 1987, the same year he was born. He is the cousin of former NBA point guard Gilbert Arenas. Like Gilbert, his paternal grandfather is of Cuban descent. His brother, Armando Murillo, was a Golden Helmet winner at Robinson High School in Tampa, and started at defensive back for the University of Nebraska in 2007 and 2008. On May 21, 2011, Arenas graced the cover of Sports Illustrated after a category 4 tornado tore through Tuscaloosa Alabama leaving the death toll in the double digits. Arenas is currently assisting the defensive backs and punt returners at his Alma Mater, University of Alabama. 2017 was his first year back at the University in a coaching capacity and he has already won a National title helping his tide defeat a Georgia Bulldog team, led by his former defensive coordinator, Kirby Smart, who was the Tides defensive coordinator in 2009.teamtitleAl He has a daughter with his girlfriend Stephanie. ^ Low, Chris (December 7, 2009). "Saban, Ingram, McClain sweep SEC honors". ESPN. Retrieved December 19, 2010. ^ "The former Robinson High star will face the Bucs on Saturday". TBO.com. August 19, 2010. Retrieved August 25, 2018. ^ "Javier Arenas". www.rolltide.com. Retrieved August 25, 2018. ^ "28 Javier Arenas - Alabama Athletics". Alabama Athletics. Retrieved August 25, 2018. ^ "Javier Arenas". rivals.yahoo.com. Retrieved August 25, 2018. ^ "Javier Arenas College Stats". College Football at Sports-Reference.com. Retrieved August 25, 2018. ^ "FRIDAY FLASHBACK: Arenas Punt Returns Sparks Tide Past FIU - Alabama Athletics". rolltide.com. Retrieved August 25, 2018. ^ "Oklahoma State Wins Independence Bowl". NewsOn6. Retrieved August 25, 2018. ^ "No. 3 Tigers Overcome Mistakes, Then No. 17 Tide, 41-34". LSUsports.net. Retrieved August 25, 2018. ^ "Alabama Scores With Eight Seconds Left to Knock Off Razorbacks". Arkansas Razorbacks. November 7, 2014. Retrieved August 25, 2018. ^ "No. 13 Alabama Special Teams Turns Back Tulane's Upset Bid, 20-6 - Tulane University". Tulane Athletics. Retrieved August 25, 2018. ^ "SUNDAY REWIND: Alabama 32, Mississippi State 7 - Alabama Athletics". rolltide.com. Retrieved August 25, 2018. ^ "2009 Game Recap - Official Site of the Allstate Sugar Bowl". Sugar Bowl. Retrieved August 25, 2018. ^ "Tide's Arenas sets SEC punt return for TD mark". November 21, 2009. Retrieved August 25, 2018. ^ "Consensus All-America Teams (2000-2009)". College Football at Sports-Reference.com. Retrieved August 25, 2018. ^ Thamel, Pete. "Alabama Knocks Florida Off Top". New York Times. Retrieved August 25, 2018. ^ "BCS National Championship Game: Texas vs. Alabama". Atlanta Journal Constitution. Retrieved August 25, 2018. ^ "2010 NFL Draft Listing". Pro-Football-Reference.com. Retrieved August 25, 2018. ^ "Chiefs announce McCluster, Arenas deals". National Football Post. July 28, 2010. Archived from the original on August 1, 2010. Retrieved August 3, 2010. ^ "Javier Arenas 2010 Game Log". Pro-Football-Reference.com. Retrieved August 25, 2018. ^ Dubow, Josh. "Chiefs get 6 INTs in 28-0 win over Raiders". sandiegouniontribune.com. Retrieved August 25, 2018. ^ "Chiefs Trade CB Javier Arenas to Cardinals". KCChiefs.com. ^ Ledbetter, Orlando. "Falcons agree to one-year deal with Arenas". ajc.com. Retrieved March 18, 2014. ^ Inabinett, Mark (August 11, 2015). "New York Jets altercation creates roster opening for Javier Arenas". AL.com. Archived from the original on August 12, 2015. Retrieved August 11, 2015. ^ Cimini, Rich (August 30, 2015). "New York Jets cut 12 players, including DeVier Posey". ESPN.com. Retrieved August 30, 2015. ^ "Bills sign CB/KR Javier Arenas". www.buffalobills.com. Retrieved February 3, 2016. ^ Alper, Josh. "Bills release Javier Arenas, waive/injured Kevin Reddick". ProFootballTalk. ^ "Javier Arenas signs with Ottawa of the Canadian Football League". BamaOnLine. Retrieved March 2, 2017. ^ "Javier Arenas Stats". ESPN. ESPN Internet Ventures. Retrieved May 15, 2015. ^ "Chiefs Select CB Javier Arenas with second Pick in Round 2". KCChiefs.com. This page was last edited on 27 January 2019, at 10:02 (UTC).